When expanding into a new international market, market research can make or break your success. If you bypass this crucial process, you lose sight of the customer. And increase your risk of failure. You need to assess the overseas market to determine if their products will sell there. International market research can reveal key factors that may impede the profitability of your product in the specific country or region (Literated). It can also help you determine if there is a real opportunity in that market and how to best position your product or service. But how can you carry out international market research that provides real insight that you can put into practice? In this article, I’ll provide step-by-step guidance to the crucial international market research you need to conduct before entering new international markets. I’ll also share plenty of handy free tools you can use to access reliable insights on the markets you plan to enter. Expanding a business into a new international market is challenging due to the different cultural, political, economic and regulatory environments (WinTranslation). It’s therefore essential to get a good understanding of the broader market conditions of the country you are planning to enter. “Macroeconomic indicators such as GDP growth, employment rates and birth rates will give you an overview of the state of the economy and population” (Dr. Christopher Carter). Try a PESTEL analysis to get a handle on the environmental conditions in your target market. “A PESTEL analysis examines a target market’s political, economic, social, technological, environmental, and legal dimensions in terms of both its current state and possible trends” (Carpenter and Dunung). It helps you gain clarity on the opportunities and threats you face entering a given market and the key dynamics at play that could affect your positioning. There may be important factors that make market entry particularly risky or advantageous. For example, increasing concern about the environment in many European countries may be a great opportunity for a new food brand that utilizes locally sourced organic produce. 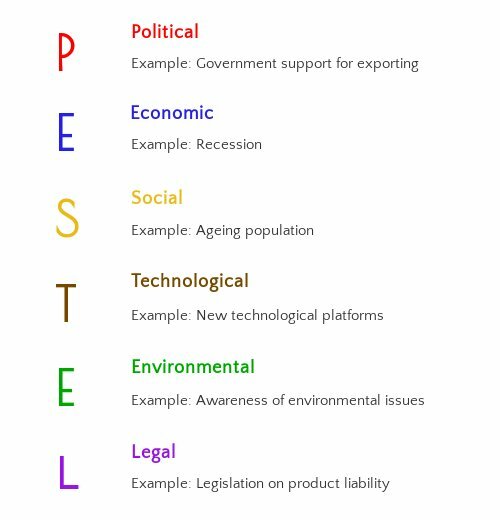 Use PESTEL analysis to assess the external environmental factors. Secondary data is invaluable for investigating the broader environmental factors. It is also indispensable for identifying demand and supply patterns as well as regulations and standards that will affect the potential of your product in the market. Fortunately, there are plenty of online resources to conduct secondary market research into global markets. The accuracy of secondary data can be questionable; so, it is important to consider the reliability and validity of the data. Reliable data sources include the World Bank, the Organization of Economic Cooperation and Development (OECD), Euromonitor, as well as trade associations and government agencies (David Gikandi). The CIA World Fact Book provides fact sheets on political, economic, and social issues on all countries globally. Prior to entering a new international market, it is also crucial to get a thorough understanding of the competition. The nature and degree of the competition will affect the viability of market entry and how you position your product in that market. If you face a lot of competition, you need to identify a clear point of differentiation or consider entering another geographical market where the competition is less strong. How can you differentiate yourself? Consider where you excel in your home market; maybe it’s your brand story, a special ingredient, or your stellar reputation for customer service. You need to identify the unique factor that sets you apart from the competition and is valued by your target market. Carrying out some competitor research will help you gain a clearer picture of where you stand against the competition. The following sites offer a useful starting point for your research. Statista is an invaluable tool for understanding the competitive landscape. You can access information on the relative size of an industry, average expenditures, and individual company expenditures. BizStats enables you to find financial information about your competitors. It also provides tools for understanding profit-risk ratios, cost of goods sold and valuation factors for your company. Alexa hones in on providing information on a company’s web presence. You can access information on audience demographics, geographic breakdowns, web traffic analysis and related sites. You can investigate how you fare against your competitors and in which aspects you outrank them. Also examine how your competitors are positioning their products in the country you are planning to enter. Look at their websites, email campaigns, and social media channels. Take a critical but considered analysis and assess what they are doing well and what they could do better. Remember that you need to evaluate what resonates with consumers rather than your personal opinion. So, try to put yourself in the consumers’ shoes and be as objective as possible. Once you have a basic understanding of the overall market conditions and the competition, you need to drill down into consumer behavior and preferences and verify that there is a real need for your product in the market. After all, if your product does not resonate with consumers, they will not buy. Start by assessing market size and characteristics to identify if there is a viable market for your product. Research consumer demographics such as percentage of the total population segmented by age, gender, occupation, household income and other relevant factors. The next step is to dig deeper into the specific behaviors, needs and preferences of consumers in your target market. Thanks to the wealth of valuable online resources, conducting secondary market consumer research is a painless but worthwhile endeavor. Let’s consider some of the tools you can use to gather useful insights. Consumer Barometer will enable you to get to grips with internet usage habits across the world. It provides details on key trends and statistics on consumers’ internet usage habits. You can also dig down to the country-level to explore consumer online behavior in your target market specifically, as well as compare digital trends over time. By providing information on the most common online search terms, Google Trends enables you to uncover real-time data to understand what matters to your target market now. You can drill further down into the data by editing the geographic and temporal targeting of the search to your specific interests. It also allows you to compare search terms by location and over time. 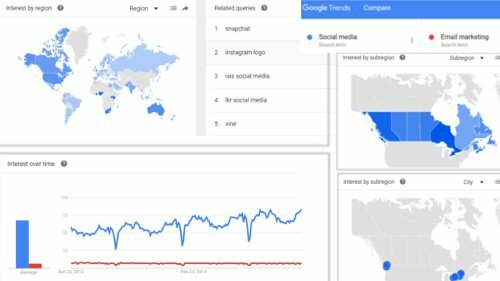 Using Google Trends to compare ‘Social Media’ and ‘Email Marketing’ search terms by time and location. Think with Google enables you to access a huge volume of free reports on a whole range of topics. With ability to search by industry, platform and region, you can really dig deep to get the information you need. Trendwatching also provides free reports on a wide range of consumer issues, including global and regional trend bulletins. Social media is useful for assessing key trends in your market and what consumers are talking about. Consider following key influencers, competitors, trade associations, government departments, and other key stakeholders in your market. Easily track key trends by organizing your followers into lists on Twitter. Social Mention is a useful tool providing real-time information about what is buzzing in your target market. Simply search for a keyword and it will display recent social posts containing that keyword, along with a list of related keywords and other insights. In the next step of your international market research you really need to zone in on how your product meets the needs of your target market. As Andrew Davis from Brandscaping says: “You can’t be everything to everyone, so commit to a niche”. Your product should fulfil the specific needs of a select segment of the population. This stage will probably require conducting primary research. So, let’s consider some of the methods that you can use. Surveys are the most common form of primary market research. This is not surprising given that they enable you to reach a large number of people at minimal cost. SurveyMonkey allows you to create in-depth surveys for free. Invest time in creating a survey that is clear, unambiguous, and easy to complete. 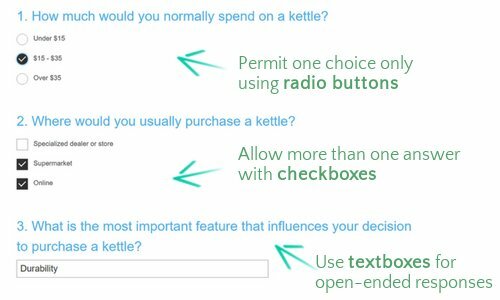 Beyond asking closed-ended survey questions, make use of the comments box for open-ended responses. This presents an open forum that could provide surprising and intuitive insights you would never have thought of. You could also conduct a Twitter survey to gather consumer opinions and reactions to your new product. Consider offering an incentive such as entry into a prize draw to encourage participation. Carefully consider which answer option is the best for your survey. Before entering a new market, be sure to assess consumer reactions to your product. Focus groups are useful for gathering consumer attitudes towards product concepts or design. They can also be used to gain insight into consumer needs, price expectations, payment methods, and much more (Sales and Marketing Management). Usability testing enables you to examine how users interact with your product or website. Open Hallway allows you to create a test scenario, record how users interact with your website remotely, then playback later for analysis. Userlytics enables you to conduct user testing of mobile apps, videos, display ads, and more. You simply set up the usability test, invite consumers to test it, and track their interaction. It enables you to get real feedback from your target market, including actions, facial expressions and spoken thoughts. These tools are not free, but the insights gained make investment worthwhile. Creating a buyer persona really helps you to understand your customers (and prospective customers). By answering a series of simple questions about your ideal customers, the MakeMyPersona tool will generate a cool buyer persona for you. The decision to expand your business internationally should not be taken lightly. It is high risk. And it requires heavy investment. By conducting international market research, you can avoid costly mistakes. Market research can help you uncover the countries offering the best (and worst) opportunities for market entry. If there are a growing number of consumers with an unfulfilled need that your product could satisfy, be sure to capitalize on this opportunity. 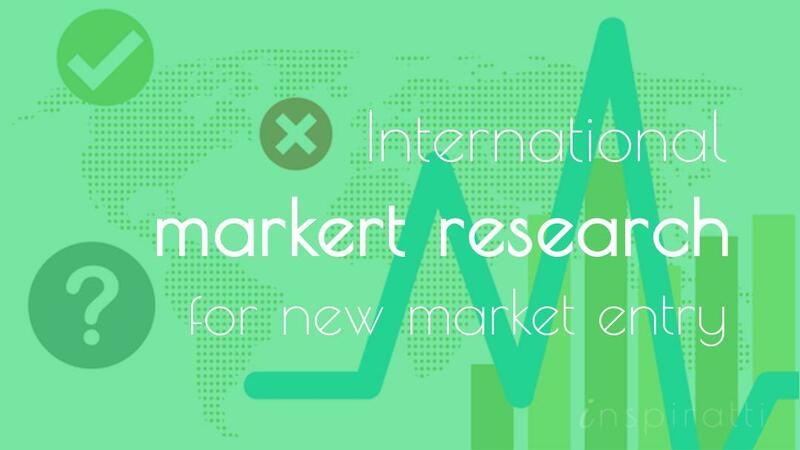 International market research can also help optimize decisions on how to position your product. You may need to adapt aspects of your product or marketing to make it relevant or attractive to new market you are entering. When conducting international market research, remember to investigate the broader market conditions, competition and consumers. You need to take into account both macro issues (e.g. the political environment of the country you wish to enter) as well as micro issues (e.g. product sales potential, market growth rate, and intensity of the competition) (Young and Javalgi). Following the guidelines in this article should help you get started. So, get ready to start making more informed decisions with effective international market research.